Most of you have probably experienced rejection at one point in your life, never be disappointing or disheartened if the door is closed. 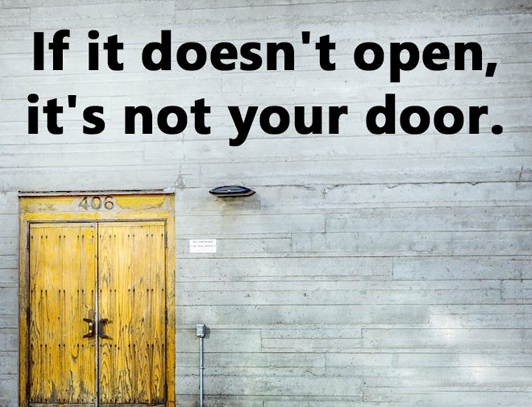 The door is closed as you are worth so much more. When I was going through a bad patch of my life, I had no home, no money and was looking for a job to provide for my family. I applied for 1153 jobs, not a single recruitment agent or consultant ever returned my call for any job I applied for, mainly because they never had the jobs in the first place and only interested in gathering CV’s and Resumes to then use to scour the job market. I still have every rejection letter to this day and use it every time delivering a talk to show individuals to be thankful for everyone who said no to you, as it will be because of them, you went and done it for yourself. Today the company I started from scratch has 5 offices worldwide, I have a staff pool of over 1500 sales consultants who sell over $1.7 billion in real estate per year. I have now had well over the 1153 number of recruitment agents or consultants call my business offering their services to find me staff and I shall never use their services ever. Will Smith said it perfectly, those who are absent during your struggle, make sure they are not present during your success.